As chief philanthropy officer, Melissa leads the national philanthropy and fundraising team at Leader Dogs for the Blind. 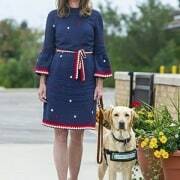 With over 15 years of experience in fundraising to serve people who are blind or visually impaired, Melissa has raised over $115 million dollars, diversified and grown Leader Dog’s revenue streams and led the successful $14.5 million-dollar capital campaign for the canine development center. She oversees Leader Dog’s philanthropic efforts including major and planned giving, foundation gifts, annual giving, estate giving, donor relations and stewardship and Lions club giving, which encompasses over 4,900 participating clubs nationwide. She has achieved year over year revenue growth and a 40% increase in major gift giving to the organization.